I realize Autumn doesn’t technically occur until later this month, but it’s September. To me, fall has arrived in a little bit of a way; not totally pumpkins yet, but apples and pears for sure. So too has Rosh Hashanah arrived, and in my attempt to learn more about Jewish food and holidays this year, I tried to do a few things for the celebration. Should a non-Jewish person ever try to craft new recipes for a people steeped in centuries of history and tradition? Probably not. So I’m learning, but there’s bound to be a few missteps. Such is the case with a challah I tried to make earlier this week. I stuffed with apple pie filling, baked it, and although it was delicious hot from the oven, it lacked something – many somethings – once cooled. I wasn’t happy with it, although the challah bread recipe itself is a solid one, and has become the only one I’ll make. Someday it will be filled with something and will turn out delicious, but that won’t happen this week. My other idea for Rosh Hashanah? Pizza. Because I know at least one person who is a self-described pizza freak, so I thought I would make this for her. It’s my ode to the eating of new fruits during Rosh Hashanah: once which have just come into season but have yet to be eaten. 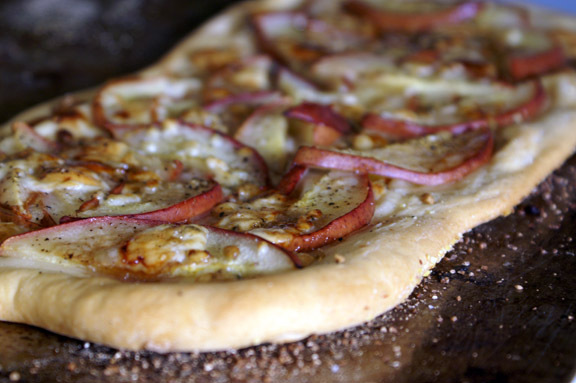 This pizza is made with red pears, which have very recently appeared in stores and are perfect right now, and pomegranate. You don’t see pomegranate in here? Good observation: because evidently it’s so early in the season that I can’t find a decent pomegranate anywhere. Instead, I made a pomegranate vinaigrette from reduced pomegranate juice, which is a dressing I use for fall salads regularly; it highlights the flavors of fall fruits and vegetables quite nicely, and works over virtually any green you throw it on. What you have here is a pizza with a bit of salad on top, which works wonderfully for a family meal or sliced up for guests as an appetizer. Look familiar? It should; I made a salad-topped pizza this past winter. This one pairs up those brand-new red pears with creamy gorgonzola and tops it off with arugula and some toasted walnuts, all slicked up with the pomegranate dressing. I’m including pomegranate arils in the recipe as well, because were I to have seen pomegranates in the markets, I would have thrown some over top as a garnish; I encourage you to do so here, if you can find them where you are. Remember me saying that I’m not sure a non-Jewish person should be crafting recipes like this? Here’s why. After I made this pizza, it occurred to me that there’s some rule about dairy, sometimes, if not all the time, with holidays. There’s gorgonzola in this pizza. Which is made, yes, with dairy. So someone tell me; is that okay? I didn’t see anything in my research about there being restrictions on Rosh Hashanah, but maybe whoever wrote those guidelines assumed a baseline of knowledge. Also, and this should be chalked up to sheer forgetfulness, because I know this: can ovens be turned on during the holiday? I know there’s a reason why most food is prepared ahead of time (other than everyone just being very organized), and I have read that it’s okay to “put fire to” something so you can turn on gas ovens, but I’m unsure of the exact rules regarding cooking the on actual holiday days. Which would be critical to making, yes, pizza. So this could be a complete non-Rosh Hashanah recipe, but even if it is, it’s a great all-the-other-days recipe, for sure. I love this flavor combination in the fall, when the pears are perfect and the air starts to take on that crisp fall smell. I was especially happy with the way this pizza turned out thanks to Faygie over at Life Tastes Good (my aforementioned pizza freak), because I finally tried her recipe for pizza dough. Without a doubt, it’s the best dough I’ve ever made myself, and I didn’t even use part semolina like the original recipe calls for. I meant to, but I kept forgetting to purchase semolina, but I’m here to tell you that the all-flour version is terrific; so, so easy to put together and roll out that I’m renouncing any and all use of store-bought dough. If you’ve found a great one to use, wonderful: by no means do you need to switch on my account, but trust me when I say that if you want to make one at home, this is the one to make. 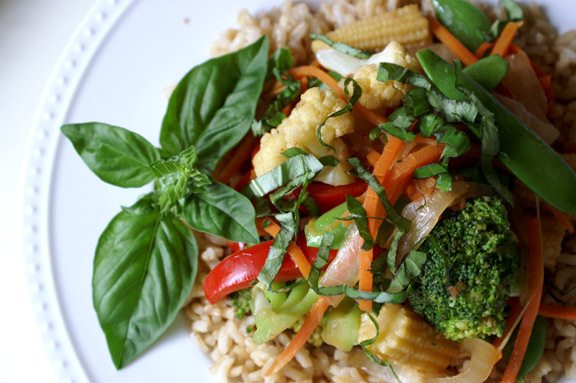 It’s delicious and worth the few minutes of effort. I made it a little easier by making it a stand mixer, so the effort I speak of? Even less. Happy Rosh Hashanah, to those of you who celebrate it: is there a better way to say that? I’m not sure, but if anyone wants to enlighten me, I’d be grateful. I like to learn, and I’m never offended when someone corrects me. Unless, of course, you’re mean about it, which makes me cry and feel sad inside. Don’t do that. Pizza made from my imagination and my love for these flavors together, with a marvelous pizza dough which is adapted slightly from Faygie’s recipe for her favorite pizza dough. I’m trying it with semolina next. *you can buy pomegranate molasses; I just can’t ever find it when I need it. If you have the same problem, you can easily make it. Take 4 cups of pomegranate juice and add it to a medium saucepan with 1/2 cup granulated sugar and the juice of 2 lemons over medium heat. Let it come to a simmer, then reduce heat to medium-low and let simmer, keeping an eye on it, for about 1 hour, until syrupy and very much like molasses (keeping in mind it gets more syrupy when cooled, so don’t let it go too far.) You’ll have a little left over, which you can use for another batch of this vinaigrette or to experiment with. Add olive oil, yeast, sugar, honey, and water to the bowl of a stand mixer. Stir and let sit until foamy, about 5 minutes. Whisk in the olive oil and salt. Fit the paddle attachment to the mixer, add in 2 cups of flour, and paddle on low until dough begins to form, adding more flour to the bowl as needed (I got to 2 1/4 cups total.) Once a rough dough has formed and has begun to pull away from the bowl, remove paddle attachment and replace with the dough hook attachment. Mix on medium speed until dough is smooth, slightly tacky to the touch, and cleans the bowl, about 5 minutes. Grease a large bowl with olive oil. Remove the dough from the bowl of the mixer, form it into a ball, and roll it around in the oiled bowl until it is completely covered. Find a warm spot in your kitchen and allow the dough to proof 2 hours under a clean towel. Once proofed, it is either ready to use or can be stored overnight in a plastic bag or sealed container. I had to punch mine down once when I left it overnight, which was a few hours after I had placed it in the refrigerator; after that pummeling, it stayed put. If you do refrigerate overnight, let it sit out at room temperature for about an hour or so before using it to allow it to get back up to temperature. In a medium bowl, whisk together the pomegranate molasses, maple syrup, honey, red wine vinegar, and Dijon mustard until blended. Slowly stream in the olive oil, whisking as you go, until emulsified. Season with sea salt and fresh ground black pepper. Set aside. Preheat oven to 450˚F. Set out two half sheet pans and sprinkle with cornmeal. Once your dough has proofed (or, if you refrigerated, come to room temperature), divide your dough into two equal sections and roll out each one into a rough rectangle. For reference, your rectangles should be the length of the long side of the half sheet pan you’ll be baking it on, and half the width of that same sheet pan; around 18 inches long and 7 inches wide. Place one dough on each pan and bake in the lower 1/3 of the oven (one per rack) for 3-4 minutes, until bubbly. Remove and set on trivets (hot pads, whatever you call them) and remember the pans are hot as you assemble your pizzas. Divide your pear slices in half and scatter your pear slices over the top of your 2 crusts, leaving a 1/2-inch border, and covering the crust as best you can. 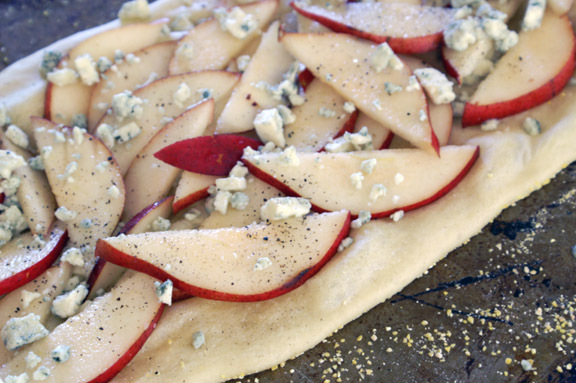 Divide and scatter the gorgonzola evenly over top the pear slices. Drizzle a little pomegranate vinaigrette over top, season with salt and pepper, and pop them back in the oven to bake until golden and bubbly, around 16-18 minutes, rotating halfway through. In the meantime, add the baby arugula to a large bowl and toss with a few spoonfuls of the pomegranate vinaigrette. Once the pizzas are done, remove them from the oven and allow to cool for a few minutes, just until they’ve stopped popping and have calmed down a bit on top. 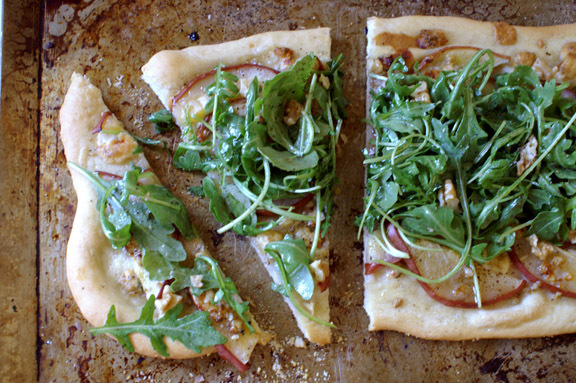 Divide the arugula salad in half, and add each half to one of the pizzas, forming a little arugula line down the center of the pizza rectangle. Top with toasted walnuts and, if you have them, the pomegranate seeds. Slice with a pizza cutter (you’ll be surprised how nicely the salad slices right along with the pizza itself) into 8 slices per rectangle, and serve. That pizza is almost too pretty to eat! So fresh and tasty looking. A lot of pizza isn’t fresh looking. I’m not sayin’ it wouldn’t be yummy, but still. Fresh on a pizza? Winner. Aaaaaand now I want to make pizza. And challah. And maybe brioche. And chocolate pudding. Which is weird because you didn’t mention brioche or chocolate pudding in this post. movita, can I come over? I’ll eat the pizza and challah and brioche and chocolate pudding, even if Shannon didn’t blog about them. for the five-hundreth time, we all need to live closer. i picture it as a non-stop cravings potluck. the neighbors would wonder why they kept seeing us wandering over to each others houses with dishes. Pizza is hard to make fresh-looking. I mean, hot and bubbly and comforting? CHECK. but fresh, not so much, especially in photos; pizza does its thing much better in person, i think. and now i want to make brioche and chocolate pudding. You know i’ve never made a from-scratch pudding? Except tapioca…that i’ve done. but i seriously dislike box chocolate pudding, and i know that homemade is probably wonderful. Great; now all i can think about is pudding. it’s not even 7 am here. First let me say that any one who is offended by your trying to learn about the traditions and holidays of another culture….should stop taking life so seriously ( or go read another blog or something)! I think your interest and research and sensitivity is amazing! Happy Rosh Hashanah is just fine. Even Happy New Year, is fine. If you want to be impressive say, “Shanah Tova,” which means “[have a] good year” in Hebrew. 🙂 As far as the milk vs meat meals, someone more traditional may correct this, but I believe that Rosh Hashana doesn’t have any rules about milk vs meat meals. You just don’t mix milk and meat in the same meal. But even better, your pizza is PERFECT for Break the Fast, which is the meal that ends a day of fasting on Yom Kippur, the day of attonement. That meal is dairy AND pomegranite is a “traditional” holiday fruit! I think your pizza looks delicious for any time of year! I love the idea of making this to break the Yom Kippur fast on! Make the dough & vinaigrette the day before, keep it in the fridge, and then bake it when the fast is over. You are all so helpful: i know NOTHING about breaking the fast on Yom Kippur, and yet you have tidily made my pizza fit right in; thank you. 🙂 I never thought of that, but you did, and that would completely work. aw, thank you! that makes me feel better; i just never want anyone to mistake my learning and the way i write to somehow be dismissive or glib about Jewish tradition, because it’s exactly the opposite. I have an intense interest and love for Jewish food and tradition, so I want to make sure i’m coming across that way and not offending anyone in the process. I’m happy to hear from you and from others that this fits in to the holiday in some ways. I’m just starting to understand the mixing meat and dairy thing with meals as being a standard versus a special thing? so your explanation helps quite a bit, thank you. I wonder what it is about sticking things in challah that seems like such a good idea? it seems like a few people have told me now that they did the same – made apple challah or fig challah, and people tend to like the original version. Amy said the only thing she likes in it are raisins, and i imagine that would be delicious. definitely something to work on, because challah is to wonderful not to play with. Our summer season is always late and so I must hold on a bit longer! Lots and lots of ripe tomatoes but the early apples are being harvested as well. It is a time of transition from one season to the next. 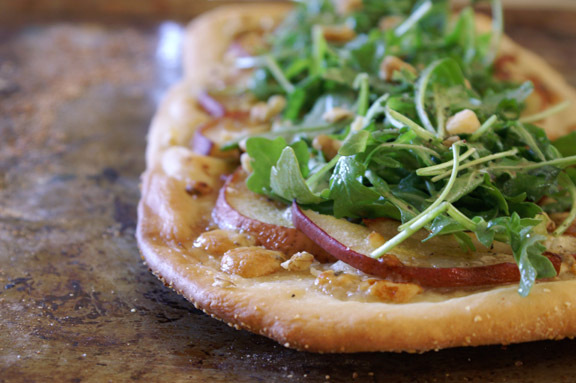 Pears, gorgonzola and arugula are such a delightful combination for a stellar pizza no matter the season or holiday! Deb, one of the many things i’ve learned from this blog is that everyone is in a slightly different part of the season in terms of food. I’m smack in the middle, it seems, but between the coasts and Canada (and beyond), we just all have slightly different timing. You hang on as long as you can to those summer fruits and vegetables! I would too, if i could, but they’re slowly disappearing from the markets. I’m excited for fall produce, but I’ll miss the summer goodness. I mean…can I sit down at your dinner table? This looks so fancy…like big time restaurant fancy. Only better, cause you made it! Gawgeous, dahling! Nope, no restriction on dairy for Rosh Hashanah, aside from the perennial no-mixing-meat-and-dairy rule that applies at any time of year for observant Jews. That said, most celebratory meals are meat-based, so it’s rare that I get to whip up something with dairy for a high holiday. I always like your help with the holiday stuff, Isabelle; i feel like since you’ve had to learn about these things later in life versus always having the traditions around, you know what it’s like trying to learn all the things. I think i was confused about the whole mixing meat and dairy thing: specifically, i guess i didn’t know if it was at the same meal, or in the same dish, or what. I think i didn’t know to what degree, or if it was holidays or all the time. Like others have said, there is no problem having dairy on the holiday. Those who keep kosher won’t serve it at a meat meal, but: a) not every person who celebrates Rosh Hashanah keeps kosher, b) there are lots of vegetarians who celebrate Rosh Hashanah who won’t be serving meat at all, c) some people I know make some of the meals meat and some of them dairy, because eating so many meat meals can be a bit much for those of us who are not huge meat-eaters. This is all great information: i count on you to tell me these things, as you explain it so much better than the internets. 🙂 The whole meat/dairy thing makes so much more sense now in terms of why and who does it, etc. and what all that means, exactly. I have thought that about the big meat things in my research; like that’s a TON of meat in a short amount of time, so i like your way of making some of the meals meat and some dairy; i bet that’s a nice break in the action, and then no one misses the dairy part of things. I like the balance there; i think even the meat-eaters i know would be a little over meat if they were to eat that much of it in a small time frame. yay! i’m happy you like it, and thank you so much for recommending the dough to me. the semolina version is on my short list of things to try soon (because i bet it’s even more amazing than the all-flour one i did), so thank you for helping me cross yet another store-bought item off my list. I’ve never stopped making those chewy granola bars for us, either, so yay for that one too. Oh and to answer your other question, since Rosh Hashanah is the Jewish new year, you can either say “Happy New Year!” or “L’Shana Tova!” (which means “for a good year).” Since you’re supposed to have a “sweet” new year, we traditionally eat apples dipped in honey, which could be my favorite part (and food) of Rosh Hashanah and I look forward to it every year. It’s so silly since I could totally dip apples in honey at any point during the year but I never seem to think of it. I really do think now i’m getting the meat/dairy thing in terms of how and when it applies, and the gravity of it. It’s somewhat like Catholics on Lent and not eating meat on fridays: even those who aren’t big into the other traditions or rituals/observances do tend to keep that one up, so that makes sense. I’ve wondered in passing about vegetarians and the Jewish holidays since it’s so meat driven, but it seems like there are plentiful sides which would be acceptable for vegetarians (although i can see how a dairy meal may be a welcome change). You could definitely do this without the cheese; i’d try and for sure have the pomegranate to add some flavor and tang, and you could always kick things up a little with some fresh herbs, too. good idea! I dig that apple dipped in honey thing: i was reading about that. why don’t we do that in general?!?! I’ve never thought to do that, and i’m trying it. L’Shana Tova! because i see on the calendar today at sundown is the beginning. Just…yum! Light and crispy crust, juicy roasted pears (I’m torn between the glory of summer produce and the return to perfect fall produce! ), creamy cheese (I ate blue cheese. Willingly! ), and peppery arugula! It looks and sounds perfectly delicious! And much better than the sad, undressed and wilted handful of arugula I plopped on top of a recent pizza. Brilliant, my dear! The apple challah sounds so delicious, I wish it (or another filling) would work out! I love that you’re trying to learn more about Jewish food and the holidays. It’s wonderful to try something new and to learn about other people’s traditions that we’re not familiar with. I have no insight to offer on the topic but I love hearing about it from the others who do. 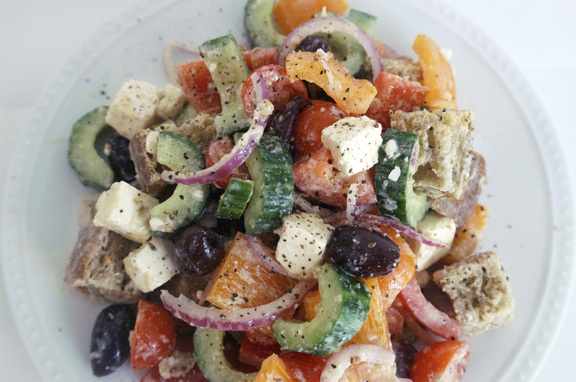 I do have an opinion on food in general and this pizza – from the dough to the salad on top – just looks so tasty. I’d love it as a meal or, as you said, sliced to serve as an appetizer. I’m happy to hear that everyone is pretty receptive to it; i’m geeky about learning things, and food has proven to be no exception. 🙂 With my own research and everyone’s help, i’ve already learned a great deal, and i’m thrilled about that. If i feel daring enough, i may pick a new food culture to explore in January while continuing to learn about Jewish food. I’m happy you like this pizza! It really is very much a combination of my favorite things, and i for one would love it as either a meal or just as a starter; it works well for both. Filling if you want it to be, but not too filling or heavy. It’s a cheese plate on a crust! With the salad right on top. I am so there! I did a flatbread pizza a while back with apple slices, but the pomegranate takes this to a whole new level. I am already thinking of new combinations. I am with you on exploring new foods and traditions not your own. I got into experimenting with recipes from a Jewish cookbook right after I got married. I overdid it for awhile – a few of my relatives wondered if my new husband was Jewish and they had missed that detail. They were almost hurt that I hadn’t told them. 🙂 It took a lot of explaining to get it across that I was just obsessed with the cookbook – no family slights involved. It IS a cheese plate on a crust! Now i’m hungry for a cheese plate… 😉 pizza is so great like that: all it requires is your imagination, and there’s almost no limit to what you can do with flavors on it. ha! people do wonder sometimes why the curiosity with things like other cultures (i like that everyone thought your husband was Jewish because of you being interested in the food); i’m just naturally curious like that, so when others do it, it doesn’t phase me at all. same! doesn’t matter what it is, if we like it, we like it. if we don’t, we don’t: there’s lots of sampling of things, to be sure, and there are lots of dislikes, but i think we try hard not to dismiss something we’ve never tried. 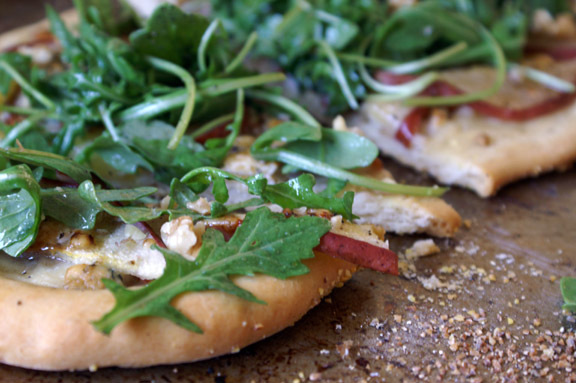 One of my FAVORITE salads – pear/gorgonzola/arugula on top of a pizza. LOVE IT. and pomegranate! and, even though it would ruin the whole “not mixing meat and dairy” thing – a bit of prosciutto would totally take this over the top. I love it and am totally adding it to the menu for my next gathering. you want to MARRY prosciutto, Natalie. But you’re completely right: it would be delicious on this. Since i CAN mix meat and dairy, i would be happy with the addition. Labor Day always means the beginning of fall for me, too. And in a way, the new year – probably a throwback to my childhood where a new school year started at this time. Anyway, lovely pizza. 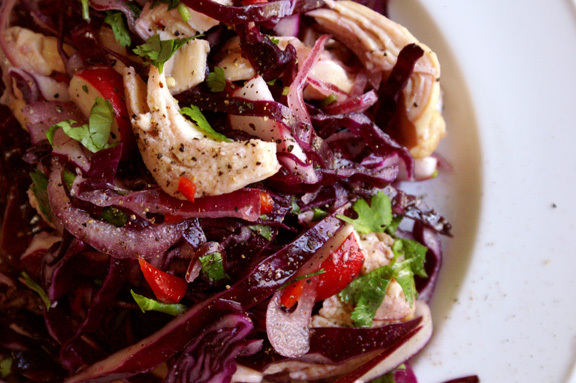 The pomegranate vinaigrette is spectacular. Thanks, John! i like the whole idea of the fall being a “new year” of sorts, yes? It seems more accurate sometimes than January 1, as the weather doesn’t change, life doesn’t shift much, and it just ends up seeming like another day. Fall always marks a nice shift in lifestyle and weather for me too. tutuorial: diy tissue fringe garland.